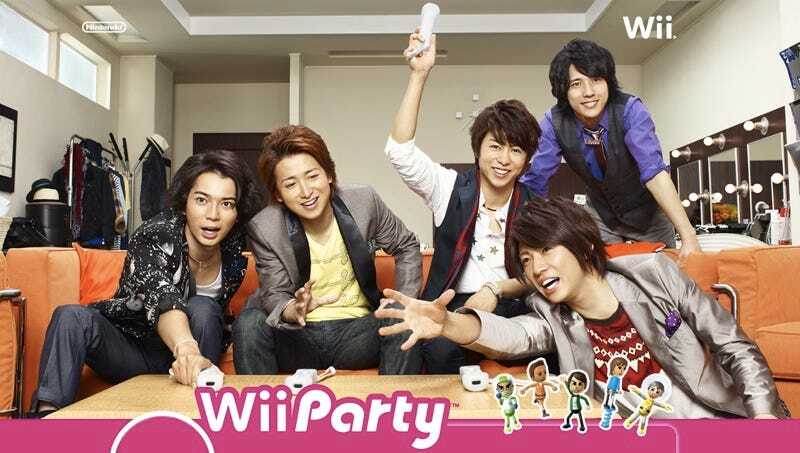 Nintendo has repeatedly roped in Japanese boy band Arashi, which means "storm" in Japanese, to promote its games. The band appeared in television ads for Super Mario Kart Wii, Super Mario Bros. Wii, Super Mario Galaxy 2 and more recently Wii Party. Wii Party is Nintendo's forthcoming party game for the Nintendo Wii. Nintendo Co., Ltd. uses many Japanese celebrities for its ads, but it seems to have the longest continuous relationship of late with this group. As anyone familiar with Arashi will tell you, the member of this boy band that has gained the most notoriety in the West is Kazunari Ninomiya, who turned in a brilliant performance as Saigo in Clint Eastwood's World War II epic Letters from Iwo Jima. Later this year, Ninomiya, or "Nino" as he is known, will star in a film adaptation of manga Ooku. And next year, he will star in a big screen version of anime/manga thriller Gantz.